Marine barbecues have become standard issue on many cruising or day-use boats because there is nothing quite like dropping anchor in a serene cove and firing up the grill to conclude the day with a fine meal. They are also handy for providing extra cooking capacity if the galley has to deal with an onslaught of hungry guests. Mounted on the stern rail or the gunwale, they are ready at a moment’s notice. They have domes and lids for more energy efficiency and better control of the cooking temperature, and they are easy to operate and clean. Stainless steel housing: High-end marine barbecues feature a double liner of stainless steel on the inside of the shell that protects against discoloration and grease leaks. In addition, it keeps the outside cooler to the touch and increases their useful lifespan. If you operate your vessel in salt water, we recommend barbecues made from marine-grade stainless steel that resists corrosion and keeps your grill looking good. Which fuel do you want, propane or charcoal? Marine barbecues are usually fueled either by gas (propane or compressed natural gas) or by charcoal. Purists may prefer charcoal grills for reasons of flavor and the ritual of building a fire to get the coals going (probably a sense of satisfaction dating from when we lived in caves, but we digress). 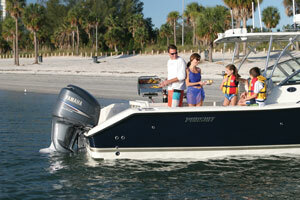 Gas grills have more components and cost more but they are many boaters’ first choice because they are convenient. They don’t require lengthy preparation; they are hassle-free to operate; they deliver heat evenly and offer better temperature control via a gas valve and a thermometer; they are easy to clean; and from an environmental perspective, they burn cleaner with less CO and soot than charcoal-fired models. The Catalina 2 Infrared Grill uses “Anti-Flare” Infrared technology. It has been redesigned with a new, rounded look. Canister or hose: Gas grills connect either to standard propane canisters (handy when you choose to take the unit ashore) or to the LPG or CNG system of your boat with a separate adapter. A swiveling bayonet mount for the control valve regulator is a safe and practical feature because it gives you the flexibility to choose a convenient mounting position and allows a safe, quick exchange of canisters. Push-button ignition: Look for piezo-crystal ignition to fire up gas grills once you have reached a tranquil anchorage after a long wet ride. These crystals are the magic that makes it possible to start the heat with the push of a button. Unlike a gas stove in a dry house that uses 110V AC power for ignition, a marine grill is exposed to the elements and has no source of electricity, so engineers came up with a system that produces an electric spark when a crystal is mechanically deformed. What form factor, round or rectangular? Marine grills come in round (“kettle”) or rectangular shapes. Kettles have a round grill and a dome to shield food from wind and reflect the heat. In recent years we have seen more boaters move to rectangular grills (perhaps because they are larger than the kettles). Kettles like the Marine Kettle 2 are the most unobtrusive and smallest, perform all the cooking operations of boiling, frying and simmering, in addition to barbecuing, but have just one burner. 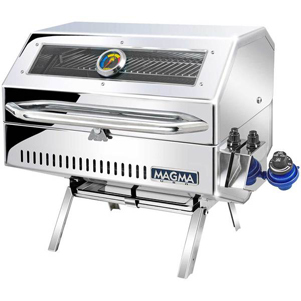 The rectangular models have multiple burners, a hinged lid and larger cooking grills. Some have a secondary rack for keeping items warm or for slow cooking. Physical dimensions: Our assortment includes three basic sizes; round grills in 15" or 17" diameter with cooking surfaces of 154 or 204 square inches, compact rectangular grills of about 22 1/2" x 10" with cooking area of about 162 sq in., and big rectangular grills in two sizes with cooking areas of 315 or 420 sq in. Btu-Ratings: Btu ratings measure a gas grill’s heat output per hour (in British Thermal Units) at the highest heat setting. 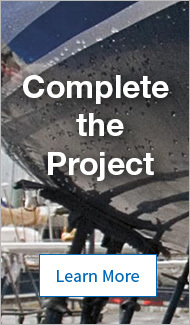 On a boat, fuel storage is limited, so efficient barbecue performance is important. Keep in mind that a one-pound propane canister is rated for 20,000 to 22,000Btu. If you’re operating a barbecue with a heat output of 20,000Btu at full throttle, one canister will last about an hour. Monterey 2 is a large grill, with rounded edges for an elegant look, a dynamic combustion system which keeps the grill lit even in heavy winds, and a dependable electronic ignition system. Do you want an infrared barbecue? You may have seen some barbecues that claim to feature a new technology called infrared (IR) cooking. What is this new IR technology and why is it better? New to boating barbecues, infrared grilling has been offered in quality backyard (land) barbecues for several years. We will explain this new cooking technology, and first we’ll start with the three basic ways to cook food. Conduction: hot fast-moving molecules excite cold, slow-moving ones to cook food from the outside like an egg cooking in a frying pan. Heat is conducted directly from one object (the frying pan) to the other (the egg). Convection: food is cooked via a medium, such as oil, water or air, to transfer heat. Hot, fast-moving molecules bump into cold, slow-moving molecules as in a conventional barbecue where heated air moves through the grill to the food using holes in the vapor plate. Grease vaporizes on the solid parts of the vapor plate to caramelize the food, and the food is cooked using hot air. This works pretty well, is widely used, and folks have patented all kinds of vapor plates with crazy hole patterns, so the technology has been explored. These first two methods of cooking food, by frying or air-heating, are not the best way to barbecue meat or fish, which brings us to the third method. 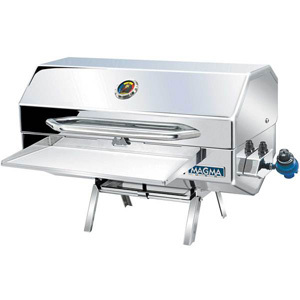 AC electric version of the compact Cabo Grill. Radiant Heat Waves: microwave or infrared. Microwaves do okay making everything the same temperature, but aren’t exactly romantic to sit around in your boat’s cockpit having drinks a few drinks and chatting with friends— while nuking a steak. Infrared technology transfers heat waves at the speed of light to the food's outside surface to allow the barbecue to sear the outside but keep the inside moist. Infrared radiation, emitted by a super-heated ceramic or stainless steel plate, heats the food directly. As the moisture inside heats up, it cooks internally using convection, but without drying, since the outside is sealed. Heat is uniformly distributed across the cooking surface and that temperatures reach over 500 °C (900 °F), allowing you to sear items quickly. Our friends at the marina who are grilling enthusiasts tell us that food cooked on an infrared grill tastes juicier, similar to food cooked on a charcoal barbecue. This makes sense, because both charcoal and IR propane grills cook using infrared heat, since charcoal emits IR radiation when burned. The advantage of an IR gas grill is that infrared heat does almost all of the cooking, while charcoal grills cook with only about 25 percent infrared heat, with the other 75 percent from convection (hot air). IR barbecues require less pre-heat time than conventional grills and have the advantages of instant ignition, a uniform heat source and better heat control. IR technology was previously patented, but the patents expired in the year 2000 and more companies are offering infrared grills at decreasing prices. Now you can have the benefits of infrared barbecuing onboard your boat. What kind of mount do you need? Is it included or optional? Mounting choices: If cruising is your lifestyle, you probably want to mount your barbecue on the pushpit or on the rail, out of the way yet easily accessible. Other mounts plug into rod holders or deck sockets that are standard on many powerboats. Depending on the design of your boat, an 8" extension may be practical to position your barbecue outboard. If you want the option of using your barbecue on land, a shore stand is a must. For sheer portability, the Cabo Grill is a great choice, with folding legs for dockside or camping use, as well as pedestal and rail mount options. We now sell both gas and electric versions. A good Sunbrella cover is also a must-have if your barbecue is to keep its attractive appearance. Stainless steel is not impervious to corrosion. Any barbecue left outdoors in a salt-water environment will eventually become rust-stained, but a cover will slow the process. 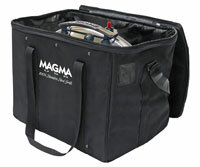 Padded carrying case for Marine Kettle 2. The most common barbecuing mistake is using heat settings that are too high. When in doubt reduce heat. Have a spray bottle of water nearby to reduce flare-ups. Light your barbecue with the lid open, and don't use the barbecue on high heat with the lid closed. Allow 2' of clearance from any combustibles on the sides and in back of the barbecue. To reduce flare-ups: Trim fat from meat, use non oil-based marinades, reduce heat and use water sprayed directly on flare-ups. Exterior: clean the exterior after each use with soapy water and a soft cloth or sponge. Keep the barbecue covered between uses. Interior: remove heavy residue from the grill and empty the grease tray between uses. Completely disassemble and clean the barbecue at least once per year, depending on use, and always prior to long-term storage. Grates: coat the grates with vegetable oil before use to prevent food from sticking. Clean with a brass wire brush while the grill is warm. Use Easy Off Oven and Grill Cleaner for burnt-on residue, disassemble and wash parts after cleaning. Wash with soapy water before long-term storage. Ceramic electrode: Keep the electrode, located beside the burner, free of grease and debris. Be careful not to damage the ceramic insulation or bend the wire. Control valve: don't attempt to adjust or disassemble. Remove any obstructing debris from the orifice with a pin or needle. Do not clean the barbecue with steel wool or abrasive cleaners.